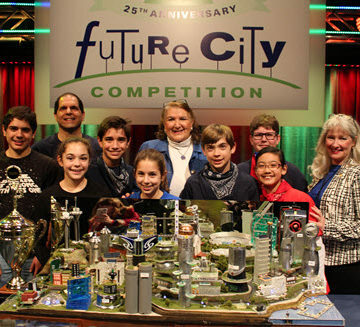 ASCE President Norma Jean Mattei, back right, joins the winning team from Austin (TX) West Ridge Middle School at the Future City Competition finals. 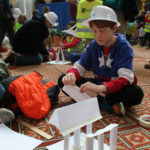 The annual Future City engineering competition attracts and colorfully presents great hypothetical concepts as imagined by teams of middle school students. This year, though, the batch of finalists was so strong, there’s a good chance elements of these hypothetical cities will be found in our real future cities someday. “These kids just astound me – the poise they have in answering our questions,” said ASCE 2017 President Norma Jean Mattei, Ph.D., P.E., F.SEI, F.ASCE, who served as one of five judges at the finals in Washington, DC. 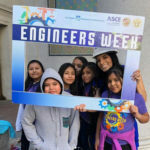 Celebrating its 25th anniversary this year as one of DiscoverE’s signature Engineers Week events, Future City challenges teams of sixth-, seventh-, and eighth-grade students to research and develop a model city throughout the school year. More than 40,000 students took part around the world. Many ASCE members serve as team mentors or regional coordinators. Don Wittmer, P.E., M.ASCE, is a regional coordinator in Chicago and, this year, oversaw all of the judging at the national competition. The West Ridge Middle School team included an ASCE logo on one of its prize-winning model buildings. Each team designs a virtual city using SimCity, writes an essay, completes a project plan, builds a scale model of their city, and creates a short – often highly entertaining – presentation highlighting their city’s key innovations. This year’s theme was the Power of Public Space. West Ridge Middle School in Austin, TX, came in first with its “Sociecity,” featuring an array of public spaces. 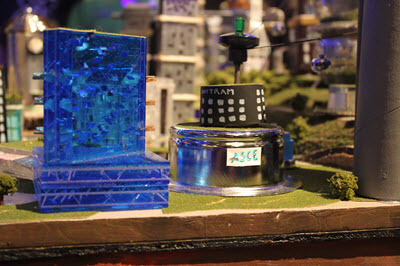 Its Future City model included plenty of moving parts such as a mechanized transportation system and fountain – even an ASCE logo on one of the buildings. “We talked about what a public space was, what you kind of want in a public space, and we all started brainstorming ideas,” said Hunter Samra, one of the team’s three finals presenters. 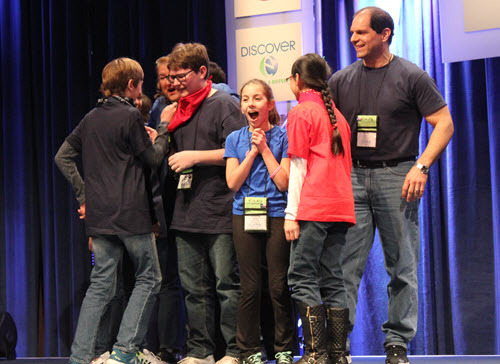 Members of the West Ridge Middle School team react after learning that they’d earned first place in the Future City Competition finals. “And we also started real early with a bunch of prototypes of all of our moving parts and we really worked hard on that first,” said Tiffany Samra, rounding out the winning trio. Two years ago, the Samra siblings’ older brother was a presenter for a West Ridge team that finished second at that Future City finals, so there is a bit of a dynasty in the works. Carol Reese is the team’s teacher, while Nick Samsa is the professional engineering mentor. “We’re just absolutely thrilled,” Reese said. Oakwood Middle School, of Canton, OH, won the ASCE-sponsored special award for Most Innovative Design of Infrastructure Systems. Learn more about Future City and how you can get involved.